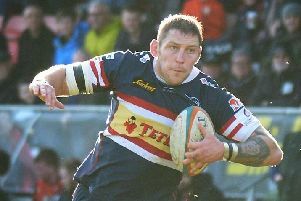 Doncaster Knights prop Ian Williams, who died last Tuesday. Doncaster Knights say they have been overwhelmed by the messages of support and condolence they have received following the sudden death of prop Ian Williams. Williams, 27, died after collapsing in training at Castle Park last Tuesday. The club issued a statement yesterday thanking people for their support. “Doncaster Knights players and coaching staff returned to Castle Park today following the tragic passing of teammate and friend Ian Willams,” said the statement. “Since the devastating news was made public last Tuesday the Club has been inundated with messages of support and condolence. “The love shown from the rugby family at all levels of our beloved sport has been truly overwhelming with literally thousands of you contacting the Club via letter, email and social media. “The kindness and compassion has helped Ian’s family through this heart-breaking time and is tribute to the closeness of the vast rugby network. “At the weekend a minute’s silence in Ian’s memory preceded countless fixtures across the country from the Premiership to grassroots level; a gesture that is truly appreciated by all at Doncaster RFC. “Plans for a tribute to Ian’s life ahead of our next home game, which is perhaps fittingly against Richmond [March 17], a Club with a long-standing relationship with the Williams Family are afoot and further details will be posted once confirmed. “With the approval of the RFU and British & Irish Cup Organising Committee, the Knights No3 jersey has been retired for the remainder of the League and Cup season.